GibsonSingleton Virginia Injury Attorneys is a drop-off location for the Marine Toys for Tots program now through December 15, 2018. We invite you to drop off new, unwrapped toys from 8:30 a.m. to 5 p.m. Monday through Friday, at our office, 4073 George Washington Memorial Highway, Hayes. We are working with the local chapter of the U.S. Marine Corps League to collect toys for children in need for Christmas. We have added the incentive that all who donate a toy at our office may receive a free ice scraper or Christmas ornament. Donors may also register for drawings to win a road-safety kit and other prizes. More information about the Toys for Tots program is available at gloucester-va.toysfortots.org and also on GibsonSingleton.com, or by contacting Beth Gibson, community outreach director for GibsonSingleton Virginia Injury Attorneys, at [email protected] or (804) 413-6777. 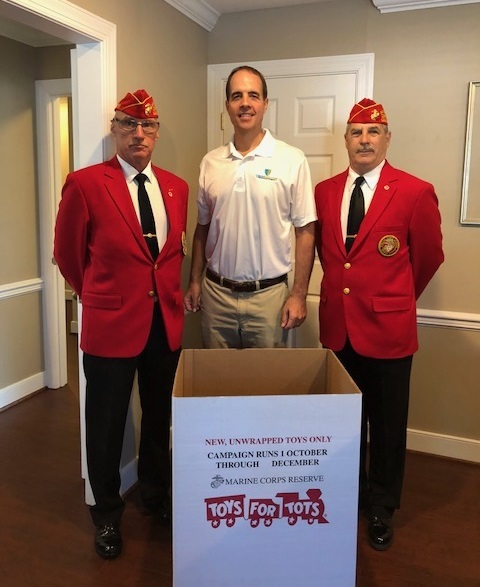 Three Marines and a Box – GibsonSingleton is working with the Middle Peninsula Detachment #1317 of the Marine Corps League to get new toys to children in need in our area this Christmas. Marine Corps League Senior Vice Commandant David Clements (left) delivers the drop-off toy box to GibsonSingleton partner Ken Gibson (middle), along with Commandant Mike Gilberti (right).